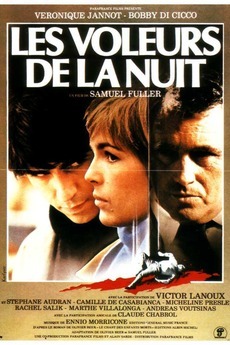 Le Bonnie and Clyde: Sam Fuller's "Thieves After Dark"
In a fairly benign and early scene in Sam Fuller's second-to-last film titled "Thieves After Dark", Isabelle (Veronique Jannot) is walking down a French street when a motorbike scoots by on her left side. Giving the cyclist a quick step into the street towards him before slyly pulling away and back into her straight-line stroll, her playful action causes the motorcyclist to swerve briefly. Neither one looks back at the other as they continue on their destined paths, and it's quite uncertain whether this is a scripted provocation or an improvised moment of playful aggression. Either way, its a moment that seemingly distills Fuller's cantankerous and gruff worldview of characters and their inner warfare. Released in 1984 and financed/shot/released in France after an especially negative experience with his Hollywood-backed film "White Dog" in 1982, "Thieves After Dark" is a tough one to find. Never released on DVD and relegated to shoddy VHS copies (which is the source I finally tracked down), the film isn't one of Fuller's best, but it still retains glimmers of his prowess as a filmmaker reflecting the European sensibilities through an Americanized eye (as he did so ludicrously with the German financed "Dead Pigeon on Beethoven Street" almost a decade earlier). Hewing close to the crime genre, "Thieves After Dark" stars the aforementioned Jannot (Isabelle) and Bobbi di Cicco (Francois) as a couple who meet after Jannot violently turns on her welfare office worker. Observing the whole event and befriending her in the street afterwards, the two commiserate on their downtrodden status and hatch up a plan to rob their respective city officials as a sort of class struggle retribution. The cross-hairs for Francois becomes Tartuffe (deliciously played in a perverse performance by legendary French filmmaker Claude Chabrol). As the duo carry out their robberies, the police become involved after a murder derails their seemingly low-grade acts of burglary which causes Francois and Isabelle to hit the road and become fugitives. What seems like ordinary noir fodder (based on a novel by Olivier Beer), in the swerving vision of Fuller becomes a sweaty, high pitched variation on Bonnie and Clyde complete with a leering Chabrol condemned to crazily stitched together close-ups, a police chief who doesn't do much besides smoke and a penultimate scene that features Francois using a dead body to protect himself from gunshots as the young daughter of the dead man cries in the distance. Basically, its everything you'd expect from Fuller throwing caution to the wind and producing a French crime picture that, perhaps, he felt was a middle finger to the establishment of rules and order in Hollywood. And if that's not enough, watching Chabrol leer and hang from a six story window in order to spy on a woman shaving her legs in the apartment next door should cater to any fix one may have. In choosing to title itself after the main character, Dan Gilroy's lacerating study of an eroding man awash in a concrete jungle of legal jargon and human indifference, "Roman J. Israel, Esq." holds true to this singular vision by never straying too far from Denzel Washington's increasingly distracted view of himself. Highly reminiscent of wiry 70's films like John G. Avildsen's "Save the Tiger" or Robert Mulligan's "The Nickel Ride", Gilroy's intelligent script places a decent man at a moral crossroads and then slowly tightens the atmosphere around him. Diversions are explored- especially in the role and performance of activist lawyer Carmen Ejogo who forms a tentative relationship with Roman- but the film stays locked on the increasingly bad decisions made by Roman after his basic support system fails him. I've heard some call this a slow-burn fizzler, but for my money, this is exactly the type of perceptive, oft-forgotten film that doesn't quite get made anymore. While Martin McDonagh's latest film keeps in step with his black-hearted, vicious characterizations, it also manages to pierce through with some insanely honest moments as it careens through an angry tale of inherent racism, police brutality, and the sneering reverberations of violence.